What—short stories? Aren’t they just for writing classes? Why would I waste time on stuff that doesn’t pay? Because it does. And this isn’t an April Fool joke. Last week Amazon announced it has sold over two million “Singles” ebooks since the launch of their Singles program a little over a year ago. Yeah. 2 MILLION. But this is where you should be doing a happy dance and shouting from the rooftops: THE SHORT STORY IS BACK! This is nothing but good news for authors no matter where you are in your career. After three or four decades of evaporating markets, the short story has found a new home in the ebook. I think it’s time for all fiction writers to start re-thinking the short form. Personally, I know I haven’t spent enough time on it. During the decade I spent writing and re-writing my “practice novel” I could have been building an inventory of short pieces that would be a gold mine now. Unfortunately, most novice writers I know are still doing the same stuff I did. They’re putting all their energy into book-length fiction or memoir and not bothering with short pieces, except maybe for a flash fiction contest or special event. In fact, I visited a critique group not long ago where one writer complimented another with the misguided advice that he shouldn’t “waste” his crisp little story—he should turn it into a novel. Of course, back in the Jurassic days when I started writing, that critiquer’s advice would have been perfectly sound. In the 1990s, most magazines had stopped publishing fiction and short stories had all but disappeared from the publishing world. Mega bookstores were in their heyday: book-length fiction was happening. So aspiring authors were told to keep our eyes on the big prize and put our energy into churning out novels in the popular genres like chick lit, cozy mysteries, and family sagas. If you are thinking of self-publishing short stories, then Writer's Life has a webinar that may help you called How to Get Published, Sell Books & Attract Tens of Thousands of Readers by Selling Your Content on Amazon’s Kindle CLICK HERE! This is a webinar that teaches writers how to self publish online, self publish to Amazon's Kindle Direct Publishing Platform and market, promote and sell written material of all kinds online. didn’t feel drawn to writing short stories. I write genre fiction. Back then, short stories were expected to be literary. Yes, there were still some paying gigs for genre stories in super-competitive markets like Women's World, Asimov’s and Ellery Queen. But mostly we were urged to write enigmatic tales of suburban angst and send them off to collect rejection slips from literary journals with a circulation of 26 and names like Wine-Dark Snowflakes of the Soul, or The Southeastern Idaho Pocatello Community Colleges North Campus Literary Review. All with the hopes we’d finally be rewarded with publication and payment of one free copy. But ebooks have changed all that. Not just because of Kindle Singles. Short story anthologies are springing up all over. They don’t all pay, but if you can get a story into an anthology with some well-known authors in your genre, you’ll be paid in publicity that would be hard to buy at any price. I’ve been offered a number of opportunities to publish fiction in anthologies this year that have really paid off. The Saffina Desforges Coffee Collection reached #1 on the anthology bestseller list as soon as it was released last December, and the Indie Chicks Anthology (which sent its profits to charity) has been a steady seller for six months—and now that it’s free it’s topping a whole lot of lists. Plus I look forward to having a story in the rom-com Martini Madness anthology coming next winter with the fabulous ladies from WG2E . I’m not advising anybody to ditch that magnum opus—most novel writers get frustrated when forced to write exclusively in the short form. But I’m saying it makes sense to put an equal amount of energy into shorter pieces. Instead of putting every idea that illuminates your brain into your novel, give a few of them a spin in short stories first. A few months ago on this blog, legendary mystery author Lawrence Block wrote about his success with self-publishing his inventory of short stories, and a few months before, Sci-Fi bestseller Jeff Carlson wrote about his success self-publishing a novella. It shot to number one in SciFi with no help from his agent or Big Six publisher. 2) An indie writer wrote me with this advice: “unless you have a break-out success with a novel, [the short story] is probably more lucrative as a return on time invested. I can make as much per sale on a ten page short story as on a 120,000 word novel.” And I know many indies who use a short piece as a free download to introduce readers to their work. 3) My editor wrote that one of his authors recently self-published a short piece she wrote on a plane and “writing, formatting, cover, etc. took less than a day.” It got 6500 downloads in the first week. I do want to stress that the above writers are all successful, published novelists with hard-earned expertise in their craft. To succeed in publishing—whether self- or traditional, you really need to put in your 10,000 Malcolm Gladwell hours. But you can maximize your efforts by putting more of those hours writing short fiction. When it’s time to make your professional debut, you’re going to have some serious inventory. Contest wins and credits for a few stories published in some good online zines look very nice in a query letter or bio, too. So forget the so-last-millennium advice to concentrate on novels. Polish those short pieces and prepare yourself for a 21st century audience. It could make you a nice chunk of change as an e-single. It might go into an anthology where it could get you new readers. You can offer it as a free download for some inexpensive publicity. Even if you’re unpublished and have a long way to go before you publish your first novel, I suggest taking time to work on some stories and build your inventory. And I recommend you enter a few contests and submit to those zines. You might just win something. If you are finding it challenging to find the time to write then you can follow the advice in Get It Done Writer's Toolkit CLICK HERE! which is an online course that teaches you how to find inspiration, write and edit your projects with expediency. It helps you stay on track and motivated as a writer, whether you are writing a novel or copywriting for a living. “Award-winning writer” has a nicer sound than “unpublished novelist,” doesn’t it? This post by Anne R. Allen with Ruth Harris was originally published with the title Why You Should Publish Your Short Fiction at http://annerallen.blogspot.ca/2012/04/why-you-should-be-writing-short-fiction.html. 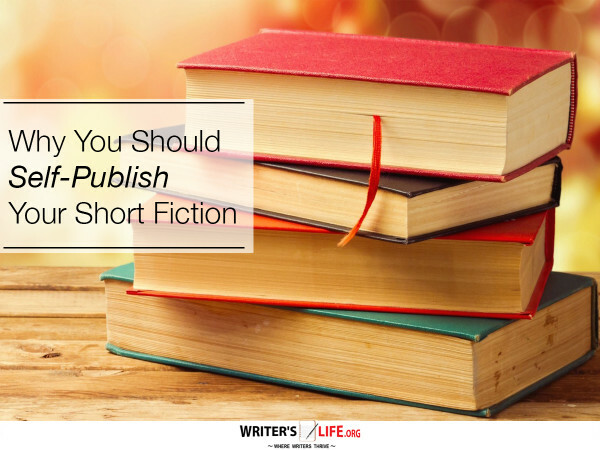 Self-publishing short fiction is a great idea. It’s probably not the best way to make a living, but it’s a great way to make a little money off of a hobby that you enjoy!